Teenager Moise Kean scored his first international goal as Italy began their Euro 2020 qualifying campaign with a comfortable victory over Finland. Juventus striker Kean, 19, was winning just his second Azzurri cap and converted a cool finish in the second half from Ciro Immobile's pass. Roberto Mancini's side went ahead in the first half through Nicolo Barella's thumping shot which deflected in. Norwich striker Teemu Pukki missed Finland's best chance from close range. Italy missed out qualification for the 2018 World Cup and scored more than one goal in a game for only the second time in their past 18 internationals. Juve winger Federico Bernardeschi could have grabbed another for the hosts, but struck wide from the edge of the box. Second Half ends, Italy 2, Finland 0. Lassi Lappalainen (Finland) wins a free kick in the defensive half. Substitution, Italy. Leonardo Spinazzola replaces Cristiano Biraghi. Nicolò Barella (Italy) wins a free kick in the defensive half. Foul by Tim Sparv (Finland). Substitution, Finland. Pyry Soiri replaces Albin Granlund. Gianluigi Donnarumma (Italy) wins a free kick in the defensive half. Attempt saved. Tim Sparv (Finland) left footed shot from outside the box is saved in the centre of the goal. Attempt blocked. Tim Sparv (Finland) left footed shot from outside the box is blocked. Substitution, Italy. Nicolò Zaniolo replaces Marco Verratti. Fabio Quagliarella (Italy) hits the bar with a right footed shot from the right side of the box. Assisted by Federico Bernardeschi. Offside, Finland. Rasmus Karjalainen tries a through ball, but Lassi Lappalainen is caught offside. Substitution, Finland. Rasmus Karjalainen replaces Teemu Pukki. Corner, Italy. Conceded by Sauli Väisänen. Cristiano Piccini (Italy) is shown the yellow card for a bad foul. Foul by Cristiano Piccini (Italy). Juha Pirinen (Finland) wins a free kick in the defensive half. Corner, Italy. Conceded by Lukás Hrádecky. Attempt saved. Fabio Quagliarella (Italy) header from the centre of the box is saved in the bottom left corner. Assisted by Federico Bernardeschi with a cross. Substitution, Italy. Fabio Quagliarella replaces Ciro Immobile. Goal! Italy 2, Finland 0. Moise Kean (Italy) left footed shot from the centre of the box to the bottom left corner. Assisted by Ciro Immobile with a through ball. Substitution, Finland. Lassi Lappalainen replaces Kasper Hamalainen. Offside, Italy. Giorgio Chiellini tries a through ball, but Ciro Immobile is caught offside. Attempt missed. Robin Lod (Finland) left footed shot from outside the box is high and wide to the left. Assisted by Kasper Hamalainen. Attempt missed. Teemu Pukki (Finland) right footed shot from the centre of the box is close, but misses to the right. Assisted by Robin Lod with a cross. Offside, Italy. 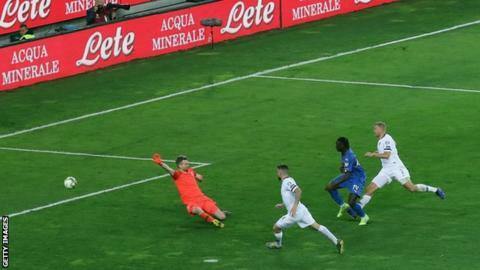 Leonardo Bonucci tries a through ball, but Ciro Immobile is caught offside. Delay in match Giorgio Chiellini (Italy) because of an injury. Marco Verratti (Italy) is shown the yellow card. Tim Sparv (Finland) is shown the yellow card. Giorgio Chiellini (Italy) wins a free kick in the defensive half. Foul by Robin Lod (Finland). Corner, Italy. Conceded by Joona Toivio.